Forget the Wii; break out the Monopoly! Nostalgic parents are opting for cheaper family time during the credit crunch. Recycled toys, educational software and traditional board games are helping toy retailers through economic turmoil, exhibitors at the London Toy Fair have said. The annual showcase featured toys such as toy soldiers, dolls speaking Punjabi and Mandarin, wooden jigsaws, weather stations and radio-controlled robots. But exhibitors and researchers said people were tending to play old-fashioned board games or invest in educational software in the economic downturn when budgets are tight and expensive outings have to be rationed. "When times are bad, people turn to nostalgia and remember good old times. We are actually pleased with the recession, because when the world is falling apart, everyone recalls their childhood memories and buys marbles," said Sarah Campbell, a sales manager at the House of Marbles. "Board games are cheap. Parents now turn to more traditional toys and don't buy so much hi-tech or high definition TVs," said Jeffrey Goldstein, a professor at the Faculty of Social and Behavioral Sciences at the Dutch University of Utrecht who was visiting the fair. 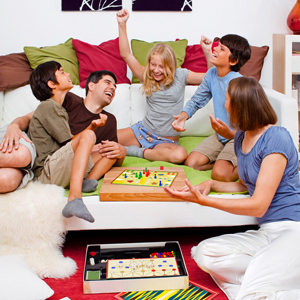 "The whole family can play board games and spend quality time together. People now pass their board games on from generation to generation to save money and inherit something beautiful." About 200 exhibitors were displaying their toy products at the ExCel exhibition center in London. They said parents were increasingly turning to brands they remember from their own childhood. "I think what we're noticing is a massive resurgence on classic toys. It's not just Lego, but a lot of classic brands, Marko Ilincic, managing director of Lego UK said. The fair took place for the first time in Brighton in 1954. Roland Earl, director general of the British Toy and Hobby Association (BTHA), said: "The toy industry holds up well despite these difficult times. Parents look for high-value items and are ready to make sacrifices for their children." Exhibitors said educational software would be in high demand this year. "Parents still invest in education in recessionary times. They rather invest in friendly games that stimulate the brain instead of war games and military toys." What toys do you think are suitable in these times? Have you started spending less on toys?